If conference room walls could talk. Designed to hold confidential conversation behind closed doors, these spaces must be adequately sized, comfortable and designed to allow people to connect. Flexibility is key in a facility where a presentation can be among a few to a large group. 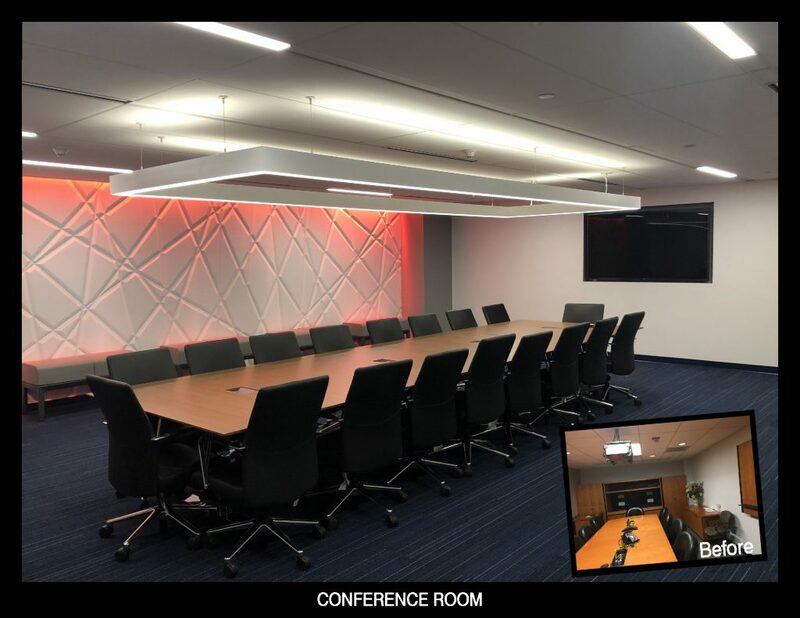 The original facility for this fortune 500 technology company has several small conference rooms that were architecturally tired and able to handle up to about dozen occupants each at a time. 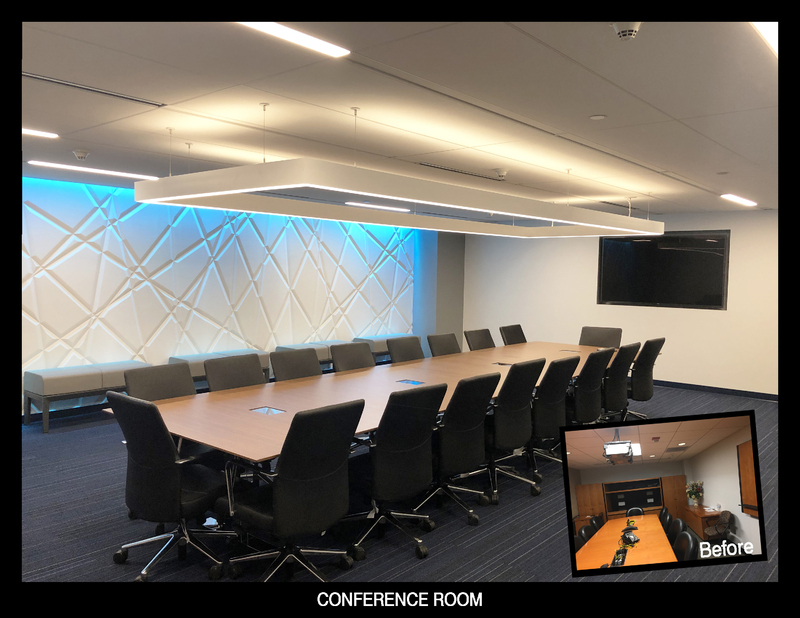 The facility desired a large conference room that could easily hold up to 2+ dozen participants, technologically current and bring a bit of grandeur to a space which harked back to the 1980’s. The solution was to combine two rooms into one large space. New finishes and furnishing were a must. A feature wall was incorporated (Interlam). One large continuous table (Nucraft Flow) was provided seating a total of 18. Additional benches (Steelcase Regard) around the perimeter allowed for additional seating. Floor finishes on a raised access floor included carpet tiles (Interface). 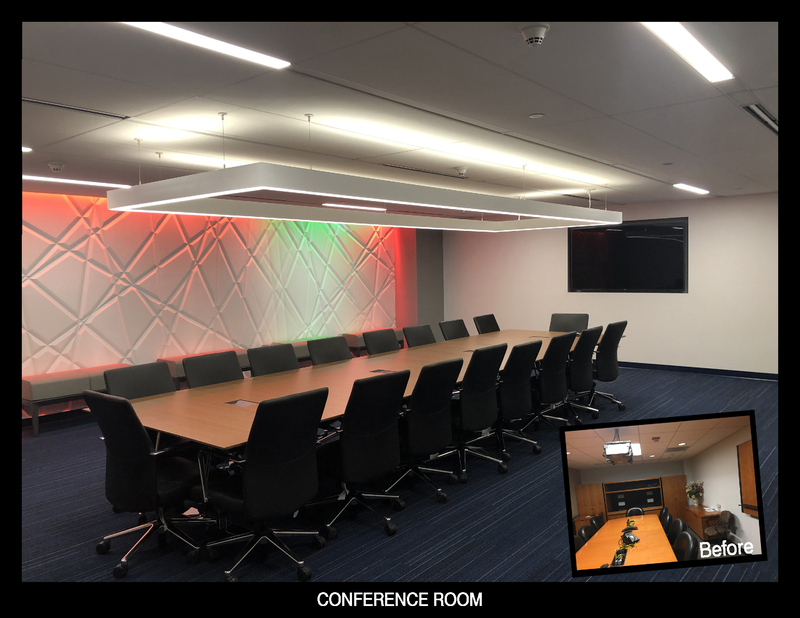 The accent wall was incorporated with color changing LED lighting allowing for a flexible mood of the space. If it is the dead of summer, a cool blue hue can achieve a cooling effect. On a cool wet winter day, a bit of red light can bring warmth. Wanting to focus on the bottom line, add a bit of green. If you looking to celebrate the holidays, add a bit of revolving color to add a little festive vibe. 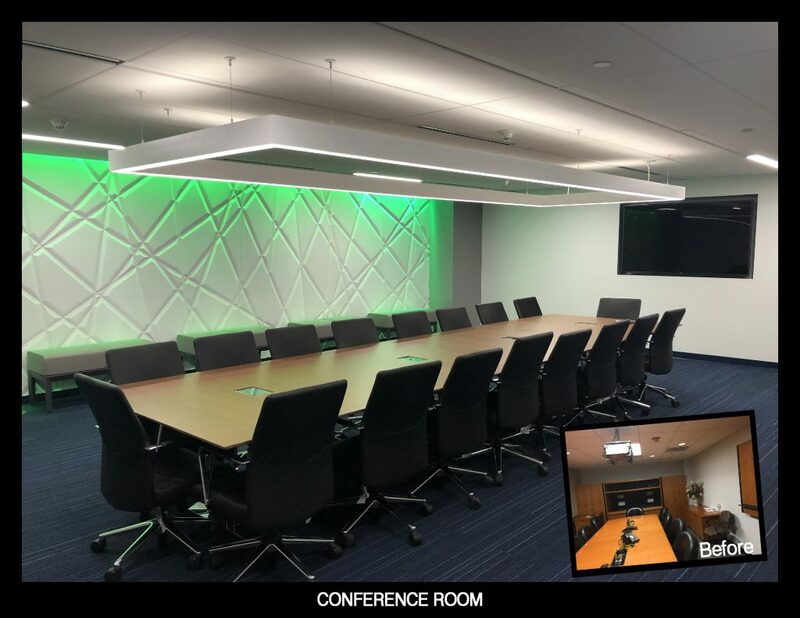 If your conference room interior design is in need of an update, new finishes, furnishing and technology can bring your facility into the 21st century.